Although I now live in Twickenham, Middlesex, my heart will always be in the south, where I lived for nearly 15 years, between the beautiful seaside towns of Portsmouth and Southampton in a town called Fareham. Most of my friends still live there and I try to visit at any opportunity, so I’m always thrilled when I’m asked to perform magic in Hampshire. 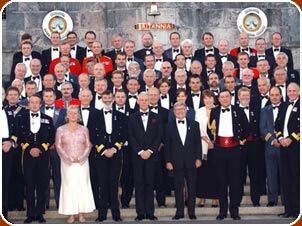 I'm also a former president of the Portsmouth and District Magic Circle, I moved to the Portsmouth, Southampton area many years ago due my earlier military career in the Royal Marines. I immediately fell in love with the area and fortunately it was close enough by train to London, that it didn't effect my London performing career. 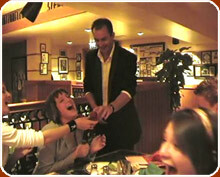 Where have my skills as a Hampshire Magician been used? 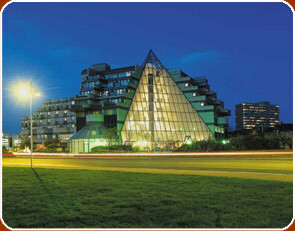 I've has been lucky enough to perform in some Hampshire's most prestigious and beautiful venues. I'm a regular performer in some of the area's top hotspots like the Portsmouth Guildhall and the Southampton Rose bowl as well as the many restaurants and nightspots in the area such as Gunwharf Quays, Port Solent and West Quay, see some my previous clients for more information. I also regularly perform further a field in locations such as Chichester, Brighton, Poole, Bournemouth, Winchester and all over Dorset, West Sussex and Hampshire. Whether celebrating the launch of a new product launch at The Hampshire Rose Bowl or attracting crowds and large volumes of potential clients to your stand at a Trade Show or exhibition at the Southampton Rose Bowl. A proven way to gain valuable leads, magicians have been successfully used all over the world, by many of the world's largest blue chip companies and corporations, to gain that extra edge for many years. Please see Corporate Magician for more information. Trying to impress a new client in Eastleigh? Looking to entertain an existing client in Fareham or thinking of a new and interesting way to entertain a visiting overseas one in Chichester? Hoping to gain the approval of a potential investor or simply wanting a relaxing time after a long seminar in Winchester? Every year you end up in charge of organising the companies Christmas Party, well this year try something different, add that extra special touch and hire me to perform as your 'Christmas Magician', I'll mix and mingle effortlessly between your colleagues, clients and families, I'll set the mood for the rest of the night and get the party off to a magical start! So whether your Christmas party is on your shop floor in Bournemouth or in a restaurant in The New Forest, if you leave the entertainment up to me and I can guarantee you a party to remember! Circulating around the tables at your Annual Awards Ceremony at the Southampton De Vere? entertaining between the courses of your birthday dinner at your favourite restaurant in the West End? or simply around your dining room table at home with your close family for your 40th Anniversary Dinner in Winchester. Plus a whole host of other South Coast hotels, function rooms and wedding venues from Brighton to Chichester and to Bournemouth and beyond. Utilising all the skills as a Strolling/Wandering Magician and all of those as a Table Magician, I will help to make your very special day, just that little bit more special! Please see Wedding Magician for more information. Champagne reception in the Portsmouth Hilton? Canapé's in the Holiday Inn, Southampton? or simply a barbeque under a marquee in your back garden in The New Forest? Let me help get the night off to a good start, as a 'mix and mingle magician', I'll create just the right atmosphere and set the mood for the rest of the night. 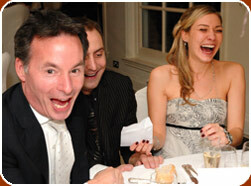 You'll hear gasps, laughter and cheers as your guests are being thoroughly entertained. Give them a night to remember and drop me an email, hopefully I'll be free on the night. Please see Close Up Magician for more information. As a close up magician in the South of England, I've been invited to perform close up magic in a huge variety of settings, from wandering the cobbled paving in the Historic Dockyard, keeping the Christmas shoppers enthralled or crowd gathering for the launch of the latest Harry Potter book. I'm completely flexible in terms of the type of performance I can deliver for you - strolling amongst your guests standing in small groups or performing between dinner courses, with guests seated at tables. Not only is this a great way to entertain and amuse your guests, but it is also a great way to 'break the ice’. 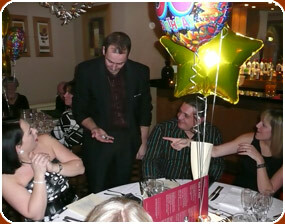 I guarantee that, not only will your guests be left spellbound, but laughing, joking and thoroughly entertained! Please see Close Up Magician for more information. The South Coast has a wonderful military tradition - the Navy at Portsmouth, Army barracks in Aldershot and Dorset, and both Army and Navy in the Southampton area. I've been invited to perform many times at Army and Navy Mess Balls and other Military functions. As a former serviceman, I completely understand the 'services humour' and tailor both my humour and act to suit the military environment I'm performing in. I'm equally at ease performing to high ranking officers as I am to the lower non-commissioned ranks and I’ve performed in nearly every military establishment and ship, in and around the Aldershot, Southampton, Portsmouth, Poole and Bournemouth areas. If you'd like further information, please don't hesitate to contact me.